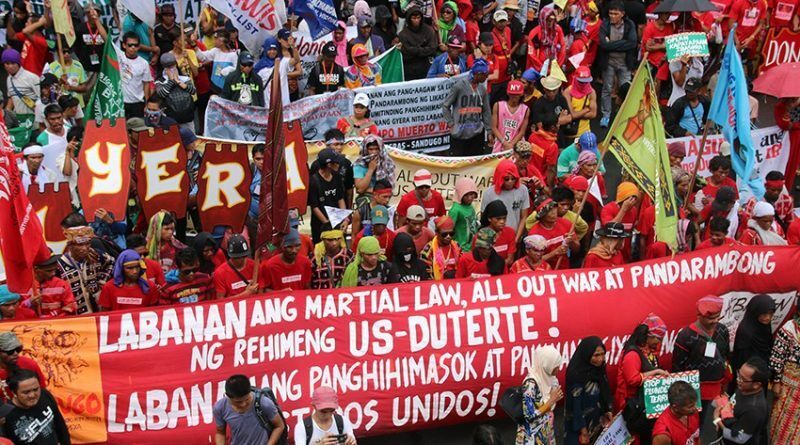 The International League of Peoples’ Struggle (ILPS) hereby endorses and supports the holding of the International Peoples’ Tribunal 2018 on Crimes Against the Filipino People, committed chiefly by the Philippine government represented by President Rodrigo Roa Duterte in collaboration with the US government represented by President Donald Trump. We call on all our member-organizations to send delegates to the trial, witness the proceedings on September 18 and 19 and participate in the solidarity events on September 20 and 21, 2018 in Brussels, Belgium. The International Coordinating Committee, commissions, global regional committees, national chapters and member-organizations are all enjoined to monitor the proceedings of the trial and disseminate widely the results of the trial. We thank you for your cooperation. We condemn the gross and systematic human rights violations perpetrated by the US-Duterte regime,, especially the most brutal crimes in the the course of its so-called war on drugs, the destruction of Marawi city and sustained martial law in Mindanao and the “all-out-war” throughout the Philippines under the US-inspired counterinsurgency program Oplan Kapayapaan. We resolutely support the victims of said human rights violations in seeking justice. We appreciate that they have organized themselves and are working closely with various organizations in strengthening efforts to hold the perpetrators to account. We laud the organizations that are convening the IPT 2018 on behalf of the victims. The organizations include the European Association of Lawyers for Democracy and World Human Rights (ELDH), Haldane Society of Socialist Lawyers, International Association of Democratic Lawyers (IADL), IBON International, and the International Coalition for Human Rights in the Philippines (ICHRP). The evidence that has been collected for the human rights violations of the US-Duterte regime is overwhelming. We hold this regime accountable for inciting the human rights violations that have resulted in mass murders, for guaranteeing impunity to the police and military malefactors and for failing to stop the atrocities even after the strong protests of the people and all organizations concerned with human rights. We are confident that IPT will succeed in further bringing to light before the international public the ongoing violations of peoples’ rights in the Philippines, exercise moral suasion and help generate further political pressure on the governments of the Philippines and the US to heed the calls of the Filipino people for justice and respect for human rights..
As always, we admire the IPT as a court of public opinion where concrete evidence is presented (through survivors and expert witnesses) of the violations of the Filipino people’s individual and collective rights under international law. The evidence is brought for judgment before the broadest possible international audience. The Tribunal’s verdict shall be based on a thorough and fair assessment of the evidence by a body of jurors composed of leading public figures of recognized achievement and high moral stature, in accordance with applicable legal standards. The body of evidence and verdict of the IPT 2018 shall be transmitted to the United Nations, various Parliaments and governments, as well as broad international organizations. The IPT 2018 shall serve due notice to the perpetrators of these violations that impunity shall not go unchallenged by the people. For further Inquiries, please write to: ipt2018@humanrightsphilippines.net.